Since The Bunker and IT share the same core crew of DJs, and have such similar taste in, well, almost everything, it only makes sense that we're teaming up to throw No Way Back once again. What you're going to get here is an event that focuses on getting the basics just right: a great sound system in a dark room, cheap bar with strong drinks, and some of the best DJs we've ever had the pleasure of hearing. Instead of booking the most hyped flavor of the month DJs, No Way Back focuses on the best that Detroit and Brooklyn have to offer. Bringing the event to Public Assembly offered a unique challenge: just what to do with a second room with a full soundsystem in place. No Way Back has always been a single soundsystem event and we didn't want to have two competing rooms of dance music. After much debate, we've decided to get deep and weird with it, and offer you an experimental chillout room. This will not be a space to hear the cliche "chill out" sounds of early 90's rave, but rather to listen to relevant artists pushing the boundaries of what's happening right here and now. The chillout room disappeared from electronic music events a long time ago, but there are more artists than ever producing deep space head music, and it's pretty much what we listen to all day at The Bunker headquarters. 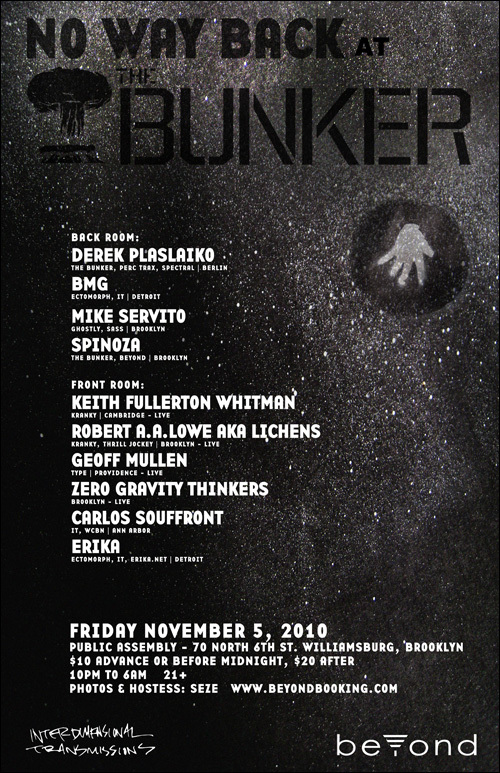 It seems the time is right to present this music at The Bunker.